On Friday afternoon, I had the opportunity to share some of the professional learning, thinking, and experiences that have resulted from my use of Google Reader with my colleagues and fellow members of Shari's Literacy Book Club. I've used Google Reader for several years, but mostly for personal use -- following the blogs of family, friends, and writers who write on topics that interest me personally. However, about a year ago, I began following the A Year of Reading blog after reading about it on Choice Literacy. 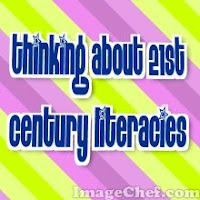 What is most valuable is that my literacy has expanded my communities. Instead of learning only from literacy leaders and the few authors I've been fortunate enough to hear at an annual conference or two, I can now learn from so many different people on a daily basis by accessing the internet. The thinking that is possible when I interact in new communities has been key to who I have become as a reader, writer and thinker. I love the way that I can become part of a community that I did not even know existed only a few years ago. Fellow book club members, I hope that you've had a few moments to check in with Reader this weekend and learn something new. I'd love to hear what you find. If my week goes according to plan, I'll post a few additional suggestions in the coming days for using Reader and blogs for your own professional learning. I am, by nature, a reflective person. The gift can be both a blessing and a curse, it depends upon the day. Lately, I haven't been creating time to be reflective, and I feel like it shows. There has been a lot to accomplish, both at home and at school, but I don't feel like anything has been getting my best mental effort. My students and I haven't been finding much time to reflect in the classroom either. Thankfully we have an uninterrupted ELA block in the morning for reading and writing workshops that allows for regular times of sharing and discussion. However, our content time for math, science, and social studies is often bracketed by lunch, recesses, and Specials. There often isn't enough time during these subjects to allow for a mini-lesson, student work time, and reflection, or "debrief," as Samantha Bennett calls it. If each day, a teacher focuses on students making meaning of important content--meaning that is inspired by the content of the minilesson, listened to during the worktime, and then labeled and celebrated in the debrief--then student thinking sits at the heart of each minute of school day. During the debrief teaching can look like sharing student thinking and work, synthesizing student thinking, labeling patterns from the worktime, making connections from the minilesson, setting the stage for the next day, holding student thinking on an anchor chart to propel the next day of thinking, summarizing on purpose, asking students to self-assess, sharing student questions raised during worktime... the possibilities are endless if you believe that student thinking matters most. I believe that "student thinking matters most," now I just need to make the time for it. This slice is a little "thick" due to the fact that I haven't posted for the past seven days. Who would have thought the first week of March would have been so busy? No prizes for this guy this year, but the challenge has been good for me. I have been living life in a sort of fog the past week or so. The sun has peeked through at various moments -- literally, last Thursday afternoon for an unseasonably warm glimpse of spring, and metaphorically, while on a weekend church retreat. Other than those moments, my mind has been clouded by illness (all five members of our family have been on antibiotics), preparations for and meeting with parents for spring conferences, and getting report cards ready for today's deadline. Of course, there have also been the other random assortment of distractions that life dishes out. Today, I could tell that the fog had lifted. I was able to complete thoughts, speak somewhat coherent sentences, and actually help my kids clean their bedroom tonight even though my wife was teaching and I was responsible for getting all three of them to bed at a reasonable hour. I was also able to do some thinking about the project my students are working on and how I want them to publish it. The creative juices were flowing once again. It's good to be back in the sunshine again. This afternoon as I left the school parking lot, I turned left, rather than right. I drove east, away from town, away from the big lake, away from the afternoon sun. As I drove I enjoyed the break from routine and began to savor the sights, familiar sights, but sights that I haven't seen for a while. I enjoyed driving through the rolling hills past the farms that haven't given in to the temptation of a quick dollar by selling out to developers. As I continued heading east, I eventually passed the CSA farm that provides our family's vegetables for 20+ weeks during the summer and fall. It reminded me that in three short (long?!) months, we would be out in those fields -- transplanting, weeding, harvesting, washing -- helping to provide the food that we as shareholders have come to love and depend on. After I reached my destination and had exchanged four clean, glass jars for four jars of fresh goats' milk, I headed for home. Thankful for a change in routine, thankful for a opportunity to get out into the country, thankful for the farmers that provide so much of our local fare. Azithromycin 100 MG. Amoxicillin. Azithromycin 200 MG.
Take 6 ML by mouth daily. Take one teaspoonful by mouth once daily for 5 days. Take two teaspoonfuls by mouth twice daily for 10 days. Three cases of strep throat. Three diagnoses of pinkeye in as many days. As Garrison Keillor says, "it could have been worse." On an unrelated note, peace be to memory of Garrison's brother, John Keillor. "She's heading for the love seat. Quick, grab the drops!" As this is currently the least favorite part of our family's morning routine, I picked up the small bottle with dread. I already knew what would follow. There would be wrestling, crying, tears. Getting eye drops into our 21 month old daughter's eyes is always a challenge. My wife made it to the love seat first and started to get our daughter to lay down. My daughter knew what was coming next. Sure enough, the crying began and she began to try to hide her face from me. Then she pulled out a new trick: squeezing her eyes tightly shut. It was then, amidst the tears and crying, that I think she began to think she had won. A slight grin began to form on her face. It was as if she was thinking, "as long as I keep my eyes shut tight, they won't be able to get the drops in." Well, to her credit, she was right. Yet, perseverance always pays off and when just the slightest opening was available, I squeezed the bottle of pinkeye medication and got a drop in. One down, one to go. The second eye took two drops, but they were in and she was on the way (hopefully!) to clear eyes and happier days. "Can I do the Slice of Life story contest, too?" my seven year old daughter asked. After getting her squared away with a notebook and a pencil, I got back to the ominous task of clearing off my desk at the back of my classroom. Within a few minutes she had written a "slice" from her day, a brief piece about joining me at school for the afternoon. More questions followed, about my students' writings and about my own. "I'm going to post my daily Slice of Life writings to my blog," I told her. "Can I have a blog?" she quickly asked, with excitement that I didn't want to squelch with a "someday" answer. After a few minutes of brainstorming possibilities (our family's Google Apps site? Blogger? ), checking out the age limitations on Blogger (one needs to be at least 13 years old), we settled on using my Blogger account to create a blog for her. It was an option that I felt good about, knowing that I could maintain a little "parental control" on the behind-the-scenes functions. She named her blog and picked out a template and got to work. "Should I capitalize all of the words in my title? Do I type in this big box?" she wondered, and then she was off. Ten minutes later, her first Slice of Life writing was posted and she was on the way to being a blogger. Later on, she had physically moved on to other tasks about my classroom, but her mind was still working on the new found wonder of blogging. It was this final question that reminded me of the stark contrast between her life as a digital native and mine as a digital immigrant. "Will they have computers at the retreat next weekend?" "No," I explained, wondering where the question was going. "The church retreat is at a camp in the woods. Why?" "I was just wondering how I was going to write my Slice of Life writing on my blog while we are there." Now that is certainly not something that I ever wondered when I was seven. 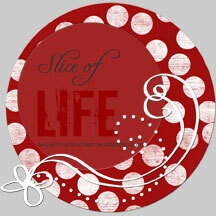 Eighteen of my twenty-seven students have signed up to participated in the Slice of Life Story Challenge. Hopefully they are all working on their first writing this afternoon. Check out the Two Writing Teachers blog for more information.